According to CNN Mexico- "The Spanish company Sol Melia to open at the end of 2011 two hotels under the "all-inclusive in Playa del Carmen: Paradisus Paradisus La Esmeralda and La Perla, which will have an investment of 83 million dollars (mdd) and share a private beach, amphitheater overlooking the sea and over 10 restaurants. Both buildings were designed by the architect Alvaro Sans, who made a project that respects the mangrove area and at the same time is adapted to the climate and vegetation, but still be modern and functional, the company said in statement Desk media. 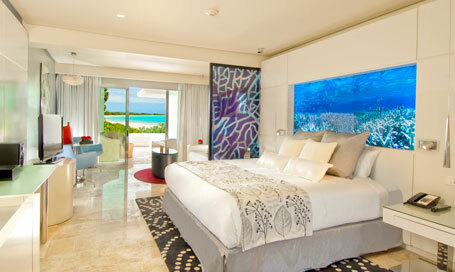 Paradisus The Pearl is the first hotel brand to offer a service designed exclusively for adults. Will have 394 suites, 120 with Royal Service and two presidential suites. One of the attractions are the swim-up suites, which allow guests to exclusive access to the pool from their terraces. Paradisus La Esmeralda will feature 512 suites, including 56 suites, swim-up, 122 Family Concierge suites, two presidential suites and a choice of rooms with two or three bedrooms. The two resorts of Playa del Carmen share a common area called the Zocalo, where you can find several dining options, the YHI Spa, the activity center "Palapa", a theater, a convention center of 7.600 m2 and 14 meeting rooms ."